Abu Dhabi: The total imports of fruits & vegetables from Thailand is set to grow thanks to aggressive promotional activities being planned by the Thai Embassy here. 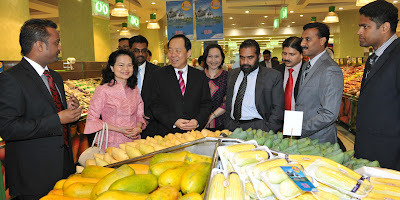 Speaking to press after inaugurating "Taste of Thailand " promotion being held in various Lulu Hypermarkets here, H.E. Mr. Somchai Charanasomboon, Ambassador of Thailand elaborated that the trade ties between Thailand and UAE has increased many fold in past years and will reach new heights in coming years. Currently fruits & vegetables constitute the major chunk of export to the UAE. Last year Thailand export touched more than US$ 2.8 billion and this year it is expected to increase by 15 %. "Thai food has always been a favourite among the residents of this region for both local and Expats and this is what we are trying to promote through this festival at Lulu Hypermarkets. More than 100 varieties of fruits and vegetables have been exclusively flown in for this festival and also on display are some of the fines Thai cuisine" said the Ambassador. The 10 day festival is being held at Lulu Hypermarkets branches in Abu Dhabi & Al Ain until 2nd October and features live cooking, contests, cultural shows, etc apart from Thai fruits & vegetables. "Currently we import more than 160 tons of fruits and vegetables every month from Thailand and we plan to promote it further. Apart from this we also import rice, tinned sea food and other Thai products for our various stores in the GCC" said Sridhara Shetty, Finance Controller of Lulu Hypermarkets group. Photo Caption: H.E. Mr. Somchai Charanasomboon, Ambassador of Thailand and Sridhara Shetty, Finance Controller of Lulu Hypermarkets group along with other officials at the inauguration function of Taste Of Thailand" promotion being held in Lulu Hypermarkets in Abu Dhabi. August 31, 2011: Bollywood superstar Salman Khan is on the verge of creating history again by breaking his own record. Salman Khan’s ‘Bodyguard’ is poised to become the largest ever digital release on UFO Moviez, the world’s largest satellite delivered digital cinema platform. ‘Bodyguard’, produced by Alvira & Atul Agnohotri, and Reliance Entertainment, is all set to screen in over 1,300 UFO digital theatres across India starting August 31, 2011. Eid has been lucky for Salman since the release of ‘Wanted’ in 2009, followed by ‘Dabangg’ in 2010. Earlier this year, Salman Khan starrer ‘Ready’ had created a record of sorts by being screened in 943 UFO digital theatres in its first week (June 3, 2011) and has been screened in 1,108 UFO digital theatres till date. ‘Dabangg’ opened to audiences in 881 UFO digital theatres in the first week (September 10, 2010) and has screened in 1065 UFO digital theatres till date. On 18th September 2009, ‘Wanted’ was released in 576 UFO digital theatres in its first week and has screened in 821 UFO digital theatres till date. Salman Khan’s films are thus being screened in an increasingly larger number of digital theatres, with every new release garnering better numbers than the earlier one. UFO Moviez, the world’s largest satellite delivered digital cinema platform, has revolutionized the way films are distributed and exhibited throughout India. Presently, UFO has a base of over 2500 digital screens, spread across more than 1300 cities in 26 states of India. Out of these 2500 screens, around 350 screens are in multiplexes (which constitutes over 30% of the multiplex population in the country) and the balance are single screen theatres. UFO has so far released more than 3600 films in 29 languages and has conducted more than 7.7 million shows.